I’m getting really into Washington State wines. Apparently, so is Neil Patrick Harris. 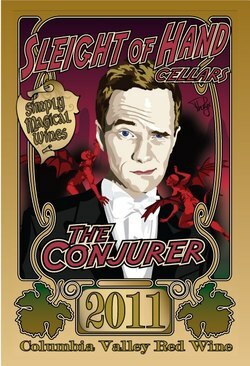 Yesterday he tweeted: “One of my favorite wineries, Slight of Hand Cellars, released their 2011 Conjurer. Delicious, with a fetching label: http://tinyurl.com/a2uwz74.” Two hours later, Fifteen minutes later (see comment below! ), their website crashed. The Conjurer is 53% Cabernet Sauvignon, 34% Merlot, 13% Cabernet Franc sourced from Walla Walla and Yakima Valley and is $28 here. Haven’t had it yet but I’m getting a bottle soon as well as a few others so will report back. The info on the site says The Conjurer is “To be shared with friends or hoarded—your call.” Will let you know what I do! Tags: cabernet, cabernet franc, merlot, neil patrick harris, walla walla, washington, wine, yakima. Bookmark the permalink. He will always be Dougie Howser, MD to me…. haha, but at least now Doogie digs the grape! The site actually crashed 15 minutes after NPH’s tweet went out. To me, the wines are some of the best coming out of Washington, and the winemaker Trey Busch is one of the best people in the wine business there is. I’ve tasted The Conjurer out of barrel a couple times, and it is a very delicious wine. Can not wait to try it! Might meet Trey in a couple of weeks. Cheers! Very funny, considering NPH’s character’s penchant for preforming magic on “How I Met Your Mother”…that’s some smart marketing! It seems as though every time I try a wine with a unique label, the wine is god-awful. I’ve learned to avoid them, unless I’m feeling particularly adventurous. Thank you for liking my post Visit to King Estate Winery: Tour, Tasting, and Romance! I think it’s 50-50 as long as it’s not a cheesy marketing kind of wine. This one’s really good though! Loved the Archimage. My husband is from Seattle so by default we buy Washington State wines if we can’t decide what we want, but they really are stepping up their game. Gone are the days when Chateau St. Michelle was our go to Washington wines. Thankfully, our local store has been tasting a ton of WA wines now and I am falling deeper and deeper in love with each sip! Thanks for liking my blog post Wines-day! Hey Leslie! Yes, I’m really liking WA wines too lately. Loved L’Ecole and Trust Cellars, plus these guys: https://grapefriend.com/2013/01/30/drink-me-washington-wines/. Which ones are you into? Thanks for stopping by and liking my blog. There are a few wineries here around Sequim/PA, so I guess I need to get out and get my taste on and help support the local guys. I do like this SOH label… I love it when companies do not take themselves seriously and have fun. It shows me that they are everyday people and that they care. wow , your blog is so cool thank you for liking my blog. I have to learn more about wine. Well you’ll learn a little and have fun here – Cheers! Interesting post! I’m still learning much about wine but I want to try that wine now. Thanks for the info! Nice! Very good wine, let me know if you try it.